We’re pleased to announce the newest member of the Redline Guiding Team: Ryan Welts. If that name sounds familiar, you must be into White Mountain legends because Ryan is pretty well known in some circles for his amazing feats and, further, for the source of inspiration that he is. Ryan — once his certifications are complete — will be adding a new angle to our hiking offerings: guided trail running. We’ll have more on that soon. For now, though, let’s focus on Ryan. Ryan with his wife, Kristina… also a well-known athlete. Ryan grew up spending loads of time hiking and skiing in the White Mountains, mostly in the Waterville Valley area. After finishing high school he was more interested in hot rods and Burger King than staying active so he ballooned to an unhealthy 240lbs by age 20. Before the birth of his first daughter, he decided it was time to get back to his roots and make some huge life changes. He began by starting to hike the NH48 in the fall of ’07. 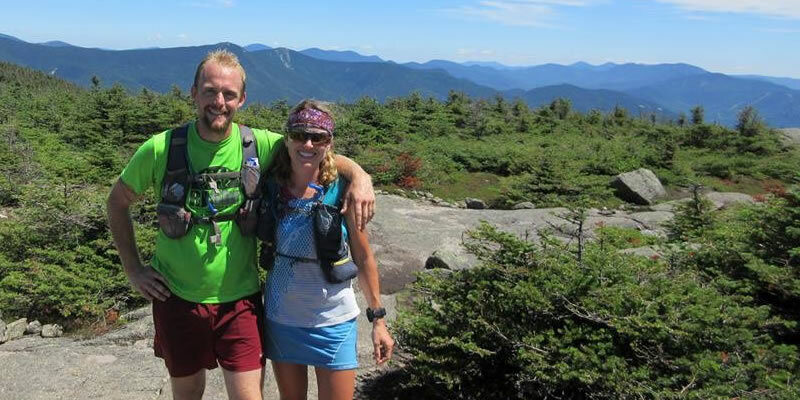 By spring ’09 he was down 90lbs, hiking and running as much as he could in preparation for his first trail race. Since then he’s completed numerous rounds of the “48” in winter and summer, holds the “Fastest Known Time” (FKT) for the winter 48 — 7 days, 7 hours, 7 minutes — and has held FKTs on the Presidential Traverse, The Pemi Loop, Franconia Ridge Loop, Mahoosucs Traverse, The 100-Mile Wilderness (ME, Appalachian Trail) as well as competing in trail races up to 100 miles all across the country. Moving fast, light and long in the mountains is what he lives for, and he loves sharing “his” world with others. When the rocks are buried by winter snows you’ll find him XC skiing, snowshoeing, or running the well packed mountain trails. Ryan, now lives a stone’s throw from the southern flanks of the Whites, in Tamworth, NH.